When magic came to Milo Speck, it came in the form of a sock. So begins Milo’s adventure in Ogregon, a place populated with hungry ogres, dino-sized turkeys, kidnapped kids, and—Dad? What’s Milo’s regular-old salesman father doing in Ogregon? I have mixed feeling about Milo Speck, Accidental Agent. On the one hand, being a small kid in a world with massively large ogres is a great metaphor for kids trying to find their place in the adult world. I like how Milo is an average kid but his willingness to try is what saves him and other kids in the end. I also LOVE the dino-sized turkeys, for me they stole the show. That being said, I have issue with Tuck, a fellow female human also trapped in Ogregon. Her stereotypical bossy female persona is a disappointment and a letdown. If Urban can create awesome dino-sized turkeys then I think she could write a character with a little more depth than Tuck. I am hopeful that this is rectified in the next book in the series. 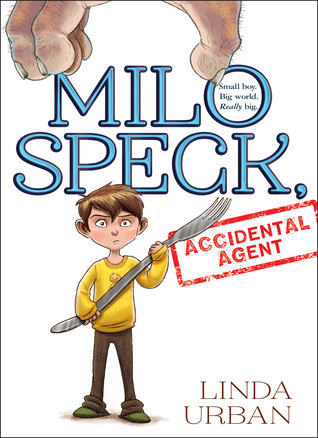 Milo Speck, Accidental Agent comes out September 1, 2015. This entry was posted in Fantasy, Middle Grade and tagged Accidental Agent, Linda Urban, Milo Speck. Bookmark the permalink.